Hi I’m Courtney and I’m currently studying Health and Social Care at South Gloucestershire and Stroud College. As part of my course I’ve been on a work experience placement at The Door, mainly working as part of the Dursley Community Youthwork team. My journey so far has been amazing, I have achieved so much, and my confidence has grown in huge amounts. My mental health has also improved because I have an amazing support network around me that has really helped me to overcome my anxieties. 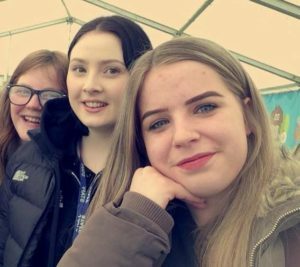 My placement has meant being a youthworker in some of our sessions and clubs, as well as doing detached work which is all about meeting young people out and about in town instead of in centres. I have also been getting involved in events and things in the community. Doing this placement I feel like I am doing something productive and I am making a difference in the young people’s lives, especially when I share some of my own experiences about what I have come up against. I also feel like I’m progressing towards being a good youthworker, I’m learning new things all the time. With the team helping me to become the best youthworker I can be and also become the best version of myself. The opportunity I’ve been given to work alongside the team has inspired me so much. They are so hard working and they really do want to make a difference in the lives of those around them. I feel like I understand who I am and what I want to be, and I’m so excited to see what the future holds for me here at The Door. Copyright © 2019 The Door Youth Project. Powered by WordPress. Theme: Spacious by ThemeGrill.